Michigan. Notre Dame. Rutgers. Auburn. Virginia Tech. 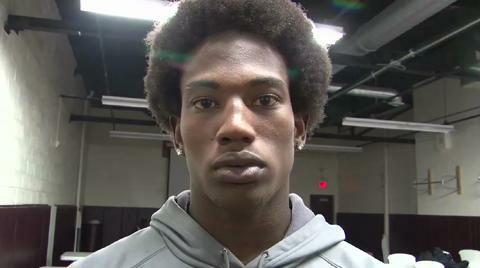 At one time, these highly regarded collegiate institutions were all offering a football scholarship to New Jersey high school All-American cornerback Yuri Wright. However, Wright's collegiate options virtually evaporated after he was expelled from his high school, Don Bosco Prep, on Jan. 19. The reason for Wright's expulsion—comments made on his Twitter account. Social media has become such an institution in American culture that high-profile athletes, even at the high school level, are "followed," "friended," or "added" by sports fans from all over the world. As a result, athletes, at an increasingly young age, need to be counseled and educated on what is appropriate and inappropriate for sites such as Facebook, Twitter, and YouTube. Ultimately, Wright was extremely lucky that Colorado coach Jon Embree decided to include him in his recruiting class, saying that Wright is remorseful over the racially charged and sexually graphic postings. Wright may have learned his lesson and promises his days with social media are over. 1. Acceptable Content: If the content of your message would not be acceptable in a personal conversation, in a telephone call, in a text message or through another social medium, it is also not acceptable for a social media website. Consider asking yourself, would I want this message seen by my parents or in a newspaper? Would I want this message attached to me five years from now? 2. Comments: Most social media websites allow for comments on whatever content you display. Most social media websites also offer a user setting which allows the user to review and approve comments before they appear. This feature should always be "on" in order to prevent any offensive or inappropriate comments. 3. Discussion: Social media websites allow users a platform to discuss ideas and viewpoints in a civilized and appropriate manner. It is imperative that athletes adhere to this type of discussion and do not pick fights or respond to someone who is attempting to pick a fight. 4. Respect: It is important high-profile that athletes not use ethnic slurs, personal insults, obscenities or engage in any other inappropriate conduct when using social media websites. It is also important to maintain privacy for issues that may be sensitve to others or the team on which the athlete participates. 5. Privacy: Personal information such as telephone numbers, email addresses, mailing addresses and residential locations should never be identified or discussed on social media websites. One never knows who may be viewing his or her account or for what purpose they may use this information. Guest article by Kevin Conroy Smith of the Kevin Smith Agency. When it comes to your personal brand your shoes and their color send a message. Every detail sends a message. When figuring out your brand, remember this: what makes you weird, makes you unique and therefore makes you stand out. Visual identity plays a significant role in the way you present yourself to both people you know and people you have not yet met. In the past, the visual part of your identity was the way your business card or resume looked. With today’s age of social technology, where the first thing people do when they meet you or hear your name is Google you, visuals have become an even more important part of your brand. You must find ways to tell your brands story with visuals. When it comes to the web, you are judged solely on what people can observe. Here is something to think about: if I were to ask you to tell me about one of your friends from high school that you haven’t seen in years but were friends with on Facebook, what would you be able to tell me about them? My guess is that you would know a lot about them. Based on what? That message you are sending your “friends” and “followers” is crucial to your brand identity because that is the only message they are getting in some cases. Do you know what message you are sending? Set a mission statement for your life. Find 10 key "words" that describe your mission/vision. Set "brand guidelines" for your social networking sites. Once a week review your online presence (Facebook, Twitter, etc.) and make sure it is aligned with your mission. Do a brand audit once a year to review your brand in depth. Research the platforms you use to promote your brand (Facebook, etc.) so you understand how to be most effective. Make sure that your business mission is aligned with your personal mission. Set daily activities to achieve your "mission" long-term. Be intentional with every single thing you do. EVERYTHING! Mere moments after winning the U.S. Open, thousands of Twitter followers viewed an exclusive picture of the championship trophy as seen through the eyes of the champion. 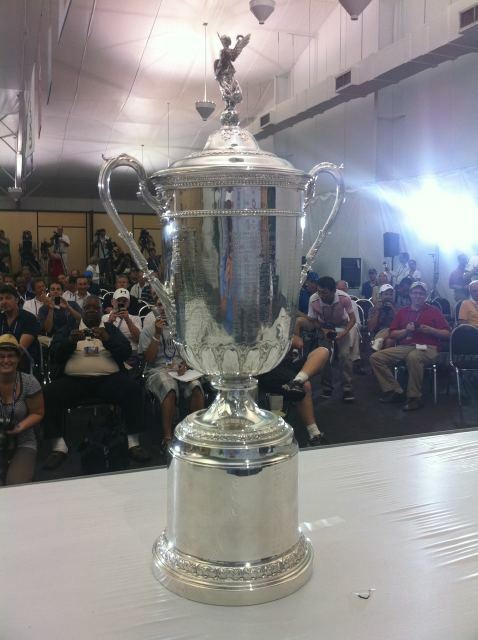 When Rory McIlroy took with his camera phone, snapped a picture of the trophy, and posted it to his Twitter account (all while seated at the media center during his news conference), he allowed potentially millions of people to see an exclusive picture that members of the media, who, ironically were shown in the background behind the trophy, could not provide. The only thing better would have been if McIlroy took out his phone and snapped a picture on the 18th green, immediately after sinking his final putt. That day may soon be coming. For McIlroy, sharing the photo was a way to let his fans join in the celebration of his victory. For the rest of us, it is just the latest example that demonstrates the power Twitter holds. On the same day McIlroy began his historic U.S. Open run, ex-congressman Anthony Weiner resigned after the uproar initiated by his posting of lewd photos on Twitter. In May, the raid of Osama bin Laden was unknowingly live tweeted by Sohaib Athar, who lived near the site of the raid. Keith Urbahn, Chief of Staff for Donald Rumsfeld, tweeted the news of bin Laden’s death first, thereby setting off an explosion of tweets that broke the news worldwide before the major news organizations had the chance to. The bin Laden story also made an impact in the athletics world on Twitter when NFL player Rashard Mendenhall sparked controversy with his tweets. Soon after the Mendenhall storm, fellow NFL player Reggie Bush caused his own commotion with his failed attempt at humor on the NFL lockout. Well, here we are again. On the eve of college basketball’s 2011 NCAA National Championship game, we find ourselves reflecting on yet another fantastic tournament and all it has brought the college basketball universe. Although March is officially over and we are a few days into April, the madness doesn’t officially end until later tonight for the men and tomorrow for the women. The teams, players, coaches and fans involved in both tournaments have shown us once again why we love March Madness and why this type of tournament is arguably the best in all of sports. For starters, a true champion is crowned - one that actually has to beat its opposition in head-to-head competition, not just run the table and hope a computer ranking system, strength of schedule, conference they play in, and potential number of alumni traveling to their bowl game (among other things) will determine its fate and its ability to have the opportunity to play for a national championship. Moreover, this tournament has enabled us to enjoy watching "mid-major" schools and coaches like Shaka Smart (VCU) and Brad Stevens (Butler) design game plans that have frustrated basketball's best coaching minds. We just watched Women's coaches Muffet McGraw (Notre Dame) and Gary Blair (Texas A&M) upset dominant UConn and Stanford teams, respectively. We have witnessed young men and women play a brand of basketball that is nothing short of fearless and every bit the result of their desire to make their dream of being a champion a reality. It's time to discard the notion these so called "mid-majors" are pulling off these "shock the world" upsets when they knock off the perennial powerhouses that are expected to waltz into the big dance. Mid-majors can compete - and beat - the best their sport has to offer. They aren't just beating the "little sisters of the poor" (to quote a certain big-time athletic director who mocked TCU and Boise State during the 2010 college football season and ironically, his head football coach has recently been suspended for rules infractions). Not that there needs to be another piece on the Jay Cutler saga, especially now that it seems the furor has died down (unless you are a Chicago Bears fan, like me), but the story does offer lessons about the ever-increasing influence of social media and the power of perception. First a couple of disclaimers. 2) …that I, too, joined the multitude of fans, who offered their thoughts via Twitter on Cutler leaving the Jan. 23 NFC Championship Game. So what motivated me to express my opinion? 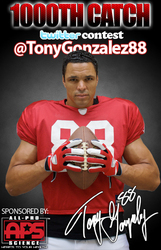 All-Pro NFL tight end Tony Gonzalez, in conjunction with his all-natural sports nutrition company All-Pro Science, Inc, is running a neat social media campaign to celebrate his 1,000th career catch. The winner of the contest will receive an autographed glove used during the 1,000th catch game and a trip for two to Atlanta to reenact the catch with Gonzalez, along with tickets to a Falcons game. Gonzalez is only one reception shy of becoming the seventh player in NFL history, and the first tight end, to reach the 1,000 catch milestone. He is expected to make this catch in the Falcons' season opener on Sunday, September 12 at Pittsburgh. It's always nice to see a professional athlete thinking outside the box to reward his fans and create good will in the community. A clever and fun social media campaign like this will definitely enhance Gonzalez's brand and reputation. This underscores the importance for pro athletes to have a strong PR team. Jen Campbell, All-Pro Science's PR Director, is doing a fantastic job and this campaign will no doubt be highly successful and create tons of positive publicity for her star client. For more details about the contest, check out the press release that Jen Campbell sent me. Athletes, if you want to build a succesful brand online, hire a team of qualified professionals that will show you how to create that quarter-inch hole. Chris Bosh's big win against a Cybersquatter and what it means for athletes. Athletes: use Twitter to build your brand, drive traffic to your website, and promote your causes. No need for a filter between you and the fans who love you. How to Train to be in NFL Linebacker Shape? Why Is My Trademark Limited? Can the Players' Associations do more? LaVar Arrington Imparts His Wisdom on NFL Rookies: "Don't Lose Focus"
Shop Faith Apparel today! "Have Faith Dream Big"
© 2019 Access Athletes, LLC.